*Please note the band pegs do not fit in the upper crossbars. These holes are for the MyRack Chin Up options. For more information call one of our specialists today. 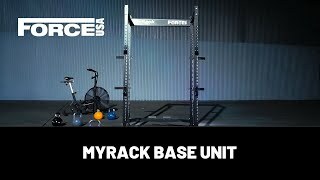 The Force USA MyRack Band Pegs come in a set of four. powder coated band pegs, they can add a wide range of resistance band training options and storage functionality to an existing MyRack power rack. The MyRack is the only custom power rack manufactured using state of the art fully automated laser cutting and robotic welding technology. Each production run is tested to meet our rigorous safety standards and weight ratings to deliver the safest and highest quality power rack to your training facility.